The early reports, and later confirmation, of Muammar Gaddafi's death at the hands of Libyan rebels flashed on news channels, websites, Facebook and Twitter this morning. And by next week people will be playing the computer game version of the death. Kuma Games, the people who turned the capture and killing of Osama bin Laden into a virtual recreation that could be played by gamers around the world, tell Kotaku that they're planning to do the same thing with the capture of Sirte, Libya and the death of Gaddafi. Is the bin Laden Kill Game Cathartic, Educational, or Just Ghoulish? Little is known yet about the circumstances surrounding the death of the Libyan dictator, first reported early this morning by rebels in the town of Sirte. Video filmed by a bystander shows that Gaddafi was captured alive near Sirte, his home town. But within minutes he had been pulled from the vehicle to the ground, and apparently shot. 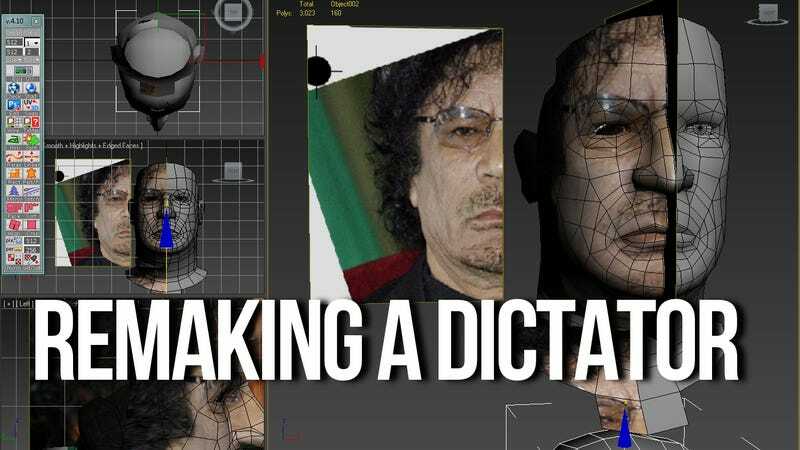 Kuma Games tells Kotaku that the team is creating a mission surrounding the capture and death of Gaddafi and that it will be another episode of their KUMA\War game with some "new technology going into it." They plan to release the episode Tuesday. "It will be about the Libyan rebel fighters' mission to capture him and end the war," a spokesperson said. "We will let you know more as we go. It's a little crazy over here, as you can imagine." I spent part of a day watching the developers work through the details of bin Laden's death in May as they rushed to turn that mission around in less than a week. Kuma Games made a name for themselves as a company that blended the timeliness and topicality of breaking military news with the immersion and interactivity of video games. Some of the nuance of real world events are lost in translation, though. For instance in the case of the bin Laden mission, players took on the role of equally balanced opposing forces tasked with either defending or capturing bin Laden.